﻿ Fun Easy English - Environment - Global warming - Climate change Impacts international. Climate change may also threaten key natural resources, affecting water and food security. Conflicts, mass migrations, health impacts, or environmental stresses in other parts of the world could raise economic, health, and national security issues for the United States. Changes in climate could have significant impacts on food production around the world. Heat stress, droughts, and flooding events may lead to reductions in crop yields and livestock productivity. Areas that are already affected by drought, such as Australia and the Sahel in Africa, will likely experience reductions in water available for irrigation. At middle to high latitudes, cereal crop yields are projected to increase slightly, depending on local rates of warming and crop type. At lower latitudes, cereal crop yields are projected to decrease. The greatest decreases in crop yields will likely occur in dry and tropical regions. In some African countries, for example, wheat yields could decline by as much as 35% by 2050. Climate change is affecting many fisheries around the world. Increasing ocean temperatures have shifted some marine species to cooler waters outside of their normal range. Fisheries are important for the food supply and economy of many countries. For example, more than 40 million people rely on the fish caught in the Lower Mekong delta in Asia, which is the largest freshwater fishery in the world. Projected reductions in water flows and increases in sea level may negatively affect water quality and fish species in regions like these, affecting the food supply for communities that depend on these resources. Climate change is very likely to affect global, regional, and local food security by disrupting food availability, decreasing access to food, and making utilization more difficult. Climate risks to food security are greatest for poor populations and in tropical regions. The potential of climate change to affect global food security is important for food producers and consumers in the United States. 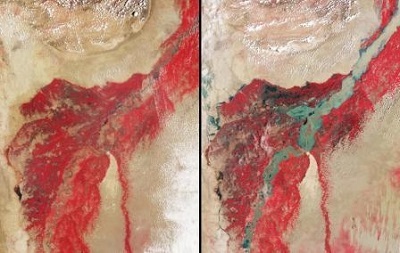 Semi-arid and arid areas (such as the Mediterranean, southern Africa, and northeastern Brazil) are particularly vulnerable to the impacts of climate change on water supply. Over the next century, these areas will likely experience decreases in water resources, especially in areas that are already water-stressed due to droughts, population pressures, and water resource extraction. 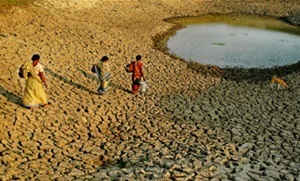 As climate changes, water is very likely to become scarce at least part of the time in many areas, but more plentiful part of the time in some areas as well. The availability of water is strongly related to the amount and timing of runoff and precipitation. With a 2.7°F rise in global mean temperature, annual average streamflow is projected to increase by 10-50% at high latitudes and in some wet tropical areas, but decrease by 10-50% in some dry regions at mid-latitudes and in the subtropics. As temperatures rise, snowpack is declining in many regions and glaciers are melting at unprecedented rates, making water less available in areas that depend on it from melting snow and glaciers during spring and summer. Droughts are likely to become more widespread. When it does rain, more precipitation is expected to fall in extreme heavy precipitation events. Increases in heavy precipitation events would not increase water supply, but instead result in increased flooding, except in river basins with large dams able to hold excess water until it is needed. Water quality is important for ecosystems, human health and sanitation, agriculture, and other purposes. Increases in temperature, changes in precipitation, sea level rise, and extreme events could diminish water quality in many regions. Large rainstorms may cause large amounts of pollutants to enter rivers and estuaries, as excess water may overwhelm wastewater systems and natural buffers. Increased pollution as well as increasing water temperatures can cause algal blooms and potentially increase bacteria in water bodies. In coastal areas and small islands, saltwater from rising sea level and storm surges threaten water supplies. These impacts may require communities to begin treating their water in order to provide safe water resources for human uses. The risks of climate-sensitive diseases and health impacts can be high in countries that have little capacity to prevent and treat illness. There are many examples of health impacts related to climate change. Worsened air quality that often accompanies heat waves or wildfires can lead to breathing problems and exacerbate respiratory and cardiovascular diseases. Impacts of climate change on agriculture and other food systems can increase rates of malnutrition and foodborne illnesses. Climate changes can influence infectious diseases. The spread of meningococcal (epidemic) meningitis is often linked to climate changes, especially drought. 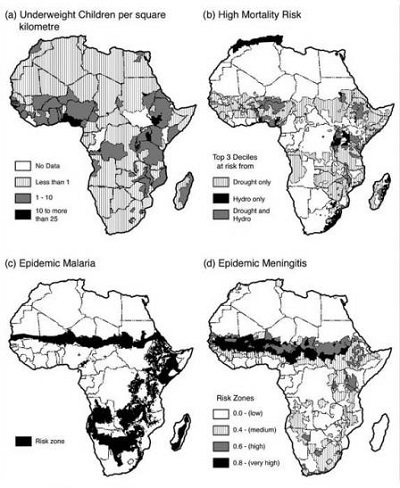 Areas of sub-Saharan and West Africa are sensitive to the spread of meningitis, and will be particularly at-risk if droughts become more frequent and severe. The spread of mosquito-borne diseases such as malaria, dengue, and West Nile virus may increase in areas projected to receive more precipitation and flooding. Increases in rainfall and temperature can cause spreading of dengue fever. The effects of global climate change on mental health and well-being are integral parts of the overall climate-related human health impacts. Mental health consequences of climate change range from minimal stress and distress symptoms to clinical disorders, such as anxiety, depression, post-traumatic stress, and suicidal thoughts. Certain groups of people in low-income countries are especially at risk for adverse health effects from climate change. These at-risk groups include urban people living in poverty, older adults, young children, traditional societies, subsistence farmers, and coastal populations. Many regions, such as Europe, South Asia, Australia, and North America, have experienced heat-related health impacts. Rural populations, older adults, outdoor workers, and those without access to air conditioning are often the most vulnerable to heat-related illness and death. For more information about the climate impacts on vulnerable populations, please visit the Society Impacts & Adaptation page. Climate change affects the migration of people within and between countries around the world. A variety of reasons may force people to migrate into other areas. These reasons include conflicts, such as ethnic or resource conflicts, degraded ecosystem services, such as lack of viable agricultural land or fresh water, and extreme events, such as flooding, drought, and hurricanes. Extreme events displace many people, especially in areas that do not have the ability or resources to quickly respond or rebuild after disasters. Many types of extreme events are becoming more frequent or severe because of climate change, which exacerbates existing conflicts. This will likely increase the numbers of people migrating during and after these types of events. Coastal settlements and low-lying areas are particularly vulnerable to climate change impacts, such as sea level rise, erosion, and extreme storms. Rising ocean temperatures and acidity may also threaten coastal ecosystems. As coastal habitats (such as barrier islands, wetlands, deltas, and estuaries) are destroyed, coastal settlements can become more vulnerable to flooding from storm surges and erosion. Both developing and developed countries are vulnerable to the impacts of sea level rise. For example, Bangladesh, the Netherlands, and Guyana are particularly at-risk. Indigenous groups in various regions--such as the United States, Latin and South America, Europe, and Africa--are already experiencing threats to their traditional livelihoods. Rising sea levels and extreme events threaten native groups that inhabit low-lying island nations. Higher temperatures and reduced snow, ice, and permafrost threaten groups that live in mountainous and polar areas. Climate effects in these areas can affect hunting, fishing, transport, and other activities. Approximately 1.4 billion people, close to one fifth of the world’s population, live below the World Bank's measure of extreme poverty, earning less than US $1.25 a day. Many lower-income groups depend on publicly provided resources and services such as water, energy, and transportation. Extreme events can affect and disrupt these resources and services, sometimes beyond replacement or repair. Many people in lower-income countries cannot afford or gain access to adaptation mechanisms such as air conditioning, heating, or disaster insurance. This lack of adaptive capacity makes the world’s poor especially vulnerable to the impacts of climate extremes, exacerbating existing conditions of poverty and inequality, and ultimately leading to more poverty. Older and younger people are also especially sensitive to climate change impacts. Children's developing immune, respiratory, and neurological systems make them more sensitive to some climate change impacts, including more frequent or severe extreme events, increased heat, and worsened air quality. Elderly populations are also at risk due to frail health and limited mobility. Extreme heat and storm events can disproportionately affect older people. Climate change impacts can differ according to gender. Worldwide, women have a higher rate of mortality than men from severe storms or other extreme events, although there is regional variation. In some regions, working-age men who work outdoors are more vulnerable to heat-related deaths. Women developing countries women may be particularly vulnerable to extreme events due to differences in poverty and physical vulnerability due to undernutrition or pregnancy. As climate change causes extreme events to become more frequent or severe, women may be disproportionately affected. Many concerns revolve around the use of natural resources, such as water. In many parts of the world, water issues cross local and national borders. Access to consistent and reliable sources of water in these regions is greatly valued. Changes in the timing and intensity of rainfall would threaten already limited water sources and potentially cause future conflicts. 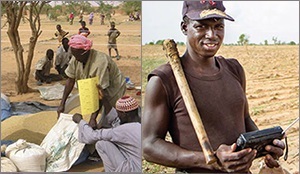 Evidence suggests most conflict is likely to occur between local communities, socioeconomic groups, and states, while bilateral and multilateral interactions have shown evidence of formal cooperation over resources. Threatened food security in parts of Asia and sub-Saharan Africa could also lead to conflict. Rapid population growth and changes in precipitation and temperature, among other factors, are already affecting crop yields. Resulting food shortages could increase the risk of humanitarian crises and trigger population migration across national borders, ultimately sparking political instability. The ongoing loss of the ice cover in the Arctic Ocean is very likely to have with national security implications. The Arctic Ocean has a long history of modest, though growing, shipping activity, including trans-Arctic shipping routes. Declining sea ice coverage will allow more access to these waters. However, a number of other international issues will influence the potential growth in shipping. In the case of the Arctic Ocean, increasing access to these waters means that issues of sovereignty (priority in control over an area), security (responsibility for policing the passageways), environmental protection (control of ship-based air and water pollution, noise, or ship strikes of whales), and safety (responsibility for rescue and response) will become more important. Cascading and interacting economic, social, and daily life circumstances have accompanied prolonged drought in rural regions. Drought-related worry and psychological distress increased in drought-declared Australian regions, particularly for those experiencing loss of livelihood and industry. Long-term drought has been linked to increased incidence of suicide among male farmers in Australia. Climate change effects—such as increases in coastal erosion, changes in the ranges of some fish, increased weather unpredictability—are already disrupting traditional hunting and subsistence practices of indigenous Arctic communities, and may force relocation of villages.